U.S. soldiers from Europe hoped to go home after VE Day. Thousands of them were diverted to the Pacific, however, anticipating brutal, bloody and costly invasions of islands including the larger islands of Japan, considering Allied experiences in places like Iwo Jima, Saipan, and Okinawa. Japanese soldiers refused to surrender when surrounded, as German soldiers had done. Instead, they tended to fight to the death, killing or wounding as many Allied soldiers as possible. So U.S. forces were unhappy at the near-suicide nature of the assignment they saw coming. On July 18 the U.S. successfully tested a nuclear bomb at White Sands, New Mexico. The test was secret, of course, from even most of the Allied Nations. President Harry Truman, a veteran of the trench warfare in World War I, worried about the effect on morale of the troops and their families, of invasions of the Japanese island strongholds, which would surely produce enormous casualties. High officials of the U.S. military debated how atomic weapons could be used, with the consensus calling for detonation of a device near the beaches to be stormed almost immediately by U.S. soldiers. Truman ultimately made the call to use one weapon on a Japanese military installation, and then demand unconditional surrender. If those terms were not accepted, another weapon would be used on another Japanese military installation. It is unclear whether the U.S. had more than the two devices used, ready for such tactics; new bombs could be created if necessary. 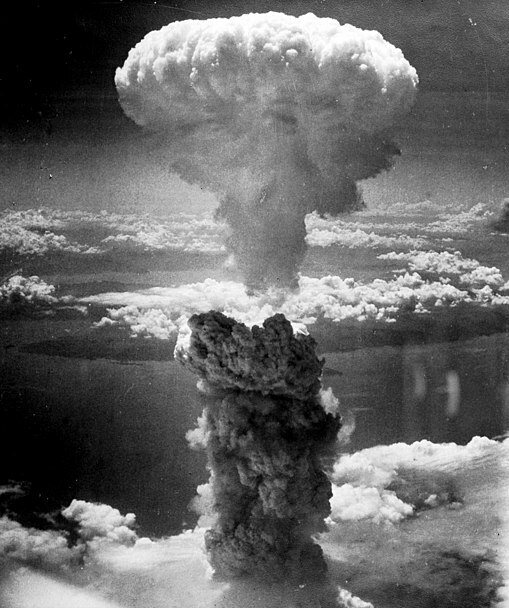 The first atomic bomb used in warfare fell on Hiroshima on August 6, 1945, a city loaded with military manufacturers. 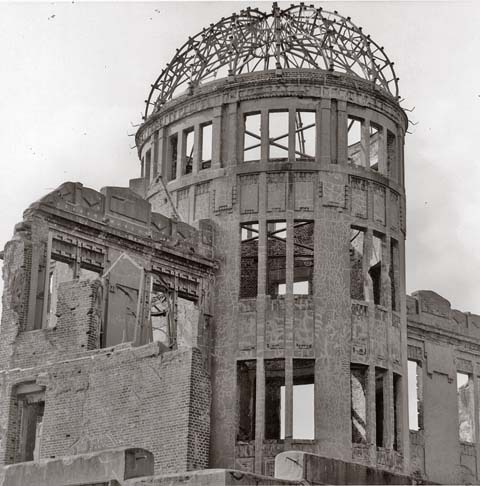 The Gembaku Dome was left unrestored, and is now a focus point for Hiroshima’s Peace Memorial. Allies demanded unconditional surrender. For various reasons, Japan did not answer quickly enough (there is one line of reasoning that says a telegram saying Japan was considering surrender was misinterpreted as “no” in Washington). The second atomic bomb used in war fell on Nagasaki, another military target, on August 9. In both cities, thousands of civilians were killed. President Truman’s calculations were that fewer soldiers and civilians would die with use of the bombs than would die in an invasion. One of the airmen aboard the B-29 that delivered the bomb snapped the famous photo of the mushroom cloud, which quickly rose to 60,000 feet over the devastated city. This photo is a symbol of the use of atomic weapons in warfare. Japan announced the nation’s accepting of the terms for unconditional surrender on August 15. The formal surrender ceremonies were conducted aboard the U.S.S. Missouri anchored in Tokyo Bay on September 2. There are several commonly used photos of U.S. military officers, Gen. Douglas MacArthur and Admiral Chester Nimitz in particular. Two images students should recognize are the Japanese officials signing the documents, and Admiral Nimitz’ signing the same documents. Caption from U.S. Navy: General Yoshijiro Umezu, Chief of the Army General Staff, signs the Instrument of Surrender on behalf of Japanese Imperial General Headquarters, on board USS Missouri Watching from across the table are Lieutenant General Richard K. Sutherland and General of the Army Douglas MacArthur. Representatives of the Allied powers are behind General MacArthur. Photographed from atop Missouri‘s 16-inch gun turret # 2. Official U.S. Navy Photograph, now in the collections of the National Archives. (BB-63), 2 September 1945. Caption from the Navy: Fleet Admiral Chester W. Nimitz, USN, signs the Instrument of Surrender as United States Representative, on board USS Missouri (BB-63), 2 September 1945. Standing directly behind him are (left-to-right): General of the Army Douglas MacArthur; Admiral William F. Halsey, USN, and Rear Admiral Forrest Sherman, USN. In front row, background, are (left to right): Rear Admiral Frederick C. Sherman, USN; Vice Admiral Charles A. Lockwood, USN; Vice Admiral John S. McCain, USN; Vice Admiral John H. Towers, USN; Admiral Richmond K. Turner, USN; Rear Admiral Robert B. Carney, USN; General Walter C. Krueger, U.S. Army; General Robert L. Eichelberger, U.S. Army and General Carl A. Spaatz, USAAF. Others identified behind the front row include (in no order): Brigadier General Joseph H. Fellows, USMC; Captain Tom B. Hill, USN; Commodore J.C. Cronin, USN; Rear Admiral Ingram C. Sowell, USN; Rear Admiral Richard E. Byrd, USN; Rear Admiral Howard F. Kingman, USN; Rear Admiral Lloyd J. Wiltsie, USN; Rear Admiral J. Cary Jones, USN; Captain John S. Thach, USN and Commodore Joel T. Boone, USN(MC). Official U.S. Navy Photograph, now in the collections of the National Archives. These images tell a story of the end of World War II in the Pacific. Students will see these images often in their lifetime, and they should be familiar enough with them to be able to identify them with some accuracy. Lesson plans: Three days of lesson plans from the Minnesota Historical Society, “The Greatest Generation in Their Own Words, including how to conduct oral history interviews, conducting an interview, study with primary and secondary documents of why those who fought in the war are called the “Greatest Generation,” and how to put together a written narrative. Newspaper headlines: Again from the Minnesota Historical Society, a collection of newspaper front pages from around Minnesota on August 14 and 15, 1945, in high quality .pdf format; additional photos and original documents are included. Images from the Library of Congress Veterans’ History Project, covering much of the history of the war, especially on the home front, available for downloading. This entry was posted on Wednesday, August 15th, 2007 at 9:01 am and is filed under 1941-1945, Atomic Bomb, Historic documents, History, History audio sources, Lesson plans, World War II. You can follow any responses to this entry through the RSS 2.0 feed. You can leave a response, or trackback from your own site. Did even the Japanese high command know Russia had invaded? I think anyone looking at all of the events, particularly with the Emperor seizing power back from the war council, would reasonable conclude it was the nuclear weapons that pushed the end of the war at that point, and not Russia’s invasion. The article does actually go some way to explaining that it was the Russian invasion that most influenced the Japanese to surrender. So why not also point out the this? Ed, thanks for the response. Sorry if I came across a bit undiplomatic – it was a rushed response, as is this one. I will read your other posts when I get five minutes later on. 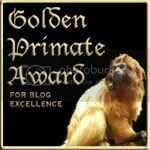 Per chance you would like to read my blog entry entitled “Justifying the Unjustifiable”? While it is accurate to say 150,000 or so died in the month following the bombs, what about the months and years after that? You no doubt are aware of the instances of genetic abnormalities and leukemia(sp?) that are occurring to this very day. I still contend it is more accurate to state that the atomic bombs dropped on Japan killed hundreds of thousands, while making clear that in total, it is MANY hundreds of thousands. I have not seen any evidence that Truman thought the bombs would save “millions of lives”, nor that he was concerned about saving Japanes lives. Truman was concerned with saving American military lives, NOT Japanese. His own diaries make that quite clear. It is also of interest, to me anyway, that Truman said in the immediate aftermath of the bombings that it had saved “thousands” of lives, within a year he had reviewed it to “tens of thousands”. It was many years before he made the extravagant claim that “millions” of lives were saved. Either way, it is a unprovable assumption. Soldiers are trained and paid to fight and risk their lives. Innocent civilians are not. I say again, it is fundamentally illigitemate to kill vast numbers of innocents in order to save your own troops, which is what Truman did with the bombs. Besides, Truman’s, and your own assertion, that the bombs saved “millions of lives”, forgets about the impact of the Russian invasion. It is quite possible the Japanese would have surrendered without the use of the bombs. On this point I recommend ‘Shockwave – Countdown to Hiroshima’ by Stephen Walker. I think there is a better case to say the Russian invasion forced the hands of the Japanese, rather than the bombs? I agree with you that we must hope this kind of decision never has to be made again. My fear is that it will, with the same outcome, because so many are willing to use doublethink to convince themselves that the bombs were just, and that they saved lives. Considering the hundreds of thousands dead in Iraq, for example, do you think it would have been more humane, less costly, to have nuked Baghdad in 2003? The death toll for both atom bomb blasts, in the month or so after their detonation, was in the neighborhood of 150,000 — fewer than the number of civilians who died in the invasion of Okinawa. No attempt to skew the numbers on this side — you’re reading into the article something I didn’t put there. The war crimes issue is a serious one, one that Robert McNamara and others have written about extensively, especially with regard to the firebombing of Tokyo, and the firebombing of Dresden in the European Theatre (I especially recommend Kurt Vonnegut’s Slaughterhouse Five on the Dresden bombing.) I think it was McNamara who noted that, if the U.S. lost the war, he and his colleagues and officials from the U.S. would be tried as war criminals for those actions. Truman’s calculations included the civilian death toll. Maybe I didn’t make that clear. The numbers mentioned in the articles I read were about a million U.S. soldiers dead, an equal or double figure for Japanese soldiers, and 5 million civilians dead, for a land invasion. Truman’s calculation was that the atomic bombs might kill 200,000 civilians. 200,000 civilians versus 5 million civilians — the calculations don’t seem to be very difficult. Japan had asked to keep their emperor as the first condition. Other conditions expected to be demanded were that the then-current government stay in power, and Japan got a release from the World War I-era treaty that limited their navy, plus Japan would keep all of its arms and men under arms. To stress their intent to push to the maximum, the Japanese used suicide guided bombs and other tactics to impress the Allies of their warring intent. Truman was troubled by that, and as Roosevelt had before him, wished that the Japanese would acknowledge their errors and accept that they would be disarmed after the war. There was also much strife in the Japanese government, with an attempted coup d’etat in the last few days of the war. So it’s not a clearcut case of the U.S. government simply being hard. Truman’s ultimatum was quite clear: Surrender unconditionally. After that, the Japanese army redoubled their suicide missions against the U.S. Navy. 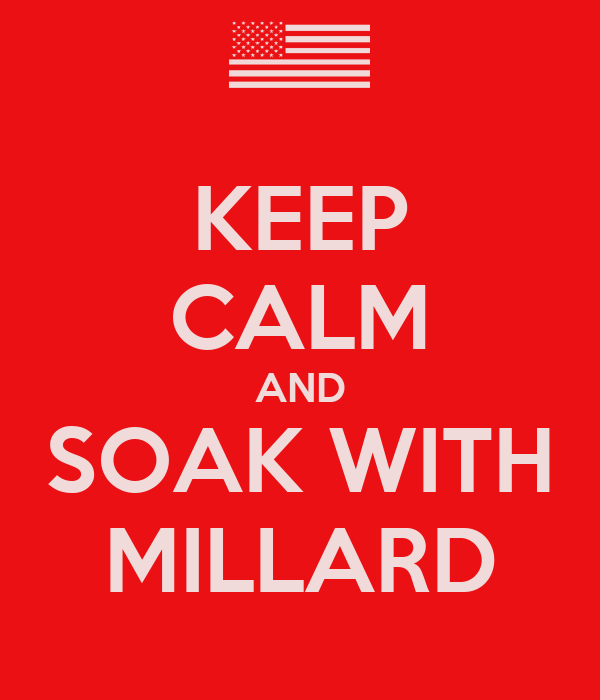 To policy makers, that didn’t look like a willingness to surrender. Truman set a date, and said a terrible new weapon would be used if Japan did not accept. Japan did not accept the conditions. After Hiroshima, the U.S. waited for a response, and let it be known more weapons were available. Japan’s official response was a bit ambiguous, but it basically said they would not surrender. Records now indicate that some in the Japanese war cabinet argued the U.S. could not possibly have more than one atomic bomb, and that Japan could fight on. After the second bomb, the Japanese accepted the terms. Disarmament was key goal, and the constitution imposed on Japan insists that Japan may have only defensive forces, a clause that is still in the Japanese constitution — they have come to love it (it frees them up to invest in ways to make money instead of making war implements), and others have come to regret (the clause prevents Japan from taking a larger role in UN police actions, among other things). If the Russian involvement was the real trigger of Japanese surrender, why did they not surrender before the USSR entered the war, why did they not surrender after the USSR entered the war? Certainly the Russian entry influenced Japan; there is not a great case to be made that it would have forced them to surrender without the a-bombs. It’s quite possible from the known facts to make the case that the use of atomic bombs saved 4,850,000 Japanese civilians. I hope no one has to make such a decision ever again. I think this article leaves a LOT to be desired in it’s claim to be educational, certainly in regard to the atomic bombings of Hiroshima and Nagasaki. It was not just “thousandsm of civilians” who died in the bombings, but HUNDREDS of thousands of innocent men, women and children. I would have thought the tens of thousands of dead children might merit a mention? The article talks about Truman’s “calculations” about costs of bomb v invasion, while omitting to make clear that it is entirely illigitimate to kill innocents in order to save your own soldiers. This is a war crime. And where is the article attempt to educate readers on the meanings and merits of the demand for an “unconditional surrender”? The only condition the Japanese wanted was to guarantee they could keep their Emperor. The article does actually go some way to explaining that it was the Russian invasion that most influenced the Japanese to surrender. So why not also point out the bomb was futile?? Go to back of the class!